Not surprisingly, fish will try to avoid being caught, so unless you proceed in the right way, you may cause great disruption in the tank when trying to catch them. Take particular care when catching fish in a community aquarium, because your attempts to net one type of fish may alarm the others and result in their attempting to take evasive action. They could even leap out of the tank undetected, while you are concentrating on catching their companions. When catching fish, remember to wear gloves as always when dipping your hands into the aquarium. Catching nets are produced in a range of sizes, so make sure you obtain one of suitable dimensions. A large net may sound like a good idea, theoretically making it easier to catch the fish, but in fact it is nowhere near as manoeuvrable as a smaller net in the confines of a tank. You need agility to match that of the fish, and a large net is almost bound to impede you by snagging on rockwork and other decor, or even disturbing the plants. Select a net that will allow you to scoop fish into it individually – in most cases, a 10cm (4in) net should be adequate, although obviously, the best size to use also depends on the size of the fish. You should never attempt to catch a large fish with a small net because this could cause injury. If you need to catch smaller, fast-swimming fish, the best approach is to ambush them from below, rather than chasing them round and round the aquarium with the net, which will be disruptive at the very least. First, place the net in the tank, lowering it right into the depths in the relatively open area of water at the front. Then either drop a little food on the surface to attract the fish, or try to steer them towards the area above the net using a clean piece of wooden dowelling. At this point, you should be able to scoop them up easily from beneath; if you try to catch them from behind, there is much more drag on the net in the water, and they will be able to elude capture fairly readily. A net is not always the best tool for catching fish, and in some cases it could even be counterproductive, especially with fish that have a snake-like shape, such as the spiny eel (Macrognathus aculeatus). If you try to catch this fish with a net, you may well find that it burrows into the substrate and simply disappears. With this type of fish, a different method is recommended, which requires stealth and a certain degree of patience. Cut a piece of clean rubber hosing long enough and wide enough to accommodate the fish, and place this in an accessible position within the aquarium. Before long, the eel is bound to investigate this new hiding-place. 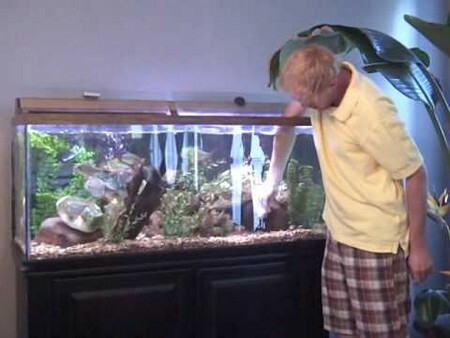 Once the fish is inside, simply lift the tubing out of the tank, placing a finger over each end to prevent the fish from slipping out, before transferring it to its new surroundings. The awkward shape of tall or deep-bodied fish such as angelfish (Pterophyllum species) makes them hard to net in the conventional way. If you do use a net, approach the fish with the net held vertically, to increase your chance of catching it. Another technique is to place a plastic bag in the water, holding the mouth open with one hand. Use the net to steer the fish into the bag, which you can then lift out of the water. These fish need plenty of oxygen, so if you will be moving them any distance, carefully bail some of the water out of the bag back into the aquarium, replacing it with air, before tying the top securely. Take particular care with spiny fish, such as the coolie loach. Spines often serve to help protect fish from predators, which spit them out once they have trouble swallowing them, and they also impede attempts to catch the fish. Coolie loaches have spines near their eyes, which they dig into the net, often resulting in their becoming stuck. If you try to force them out of the net, you might injure them, so simply invert the net in the water, and the fish should free itself quickly and swim away.